Rifle Basix Ruger Trigger for Ruger M77/MKII current production bolt action centerfires. Fits right or left hand. May be installed by user. Uses factory safety. Unique eccentric tip safety adjustment screw makes the RU-MKII the aftermarket replacement trigger of choice for Rugers. Comes complete with instruction sheet, hardware and adjustable wrench. 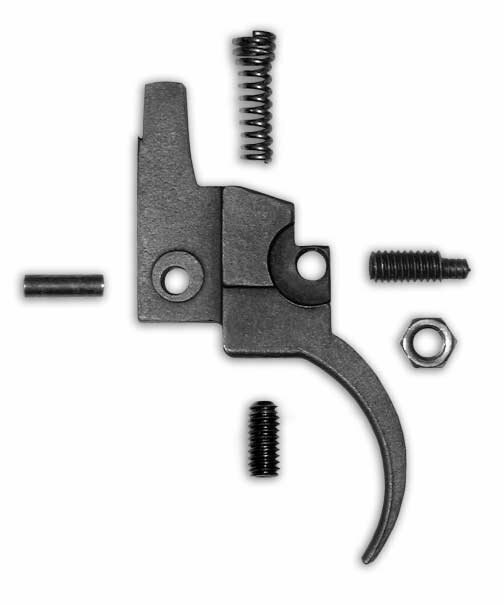 - Replacement trigger for current bolt action centerfire rifles. Aftermarket trigger of choice for Ruger’s. - Kit fits new “Hawkeye” Models with LC6 Trigger. Right or Left Hand Application as well as the NEW Ruger SCOUT! - Comes complete with instructions, hardware pack, and wrench for easy user installation. Great drop in trigger. It's my 3rd one for Ruger MKll I've bought 300 win, 7mm rem, and now my 270 win. Accuracy and crisper trigger touch off my rounds much better than the stiff pull of the factory trigger. Rifle Basics great product worth the upgrade. One note, the bottom of the tang safety may require slight filing, as it was to tight at the pin that works the safety. All three rifles required this slight mod. Not a problem and easy to file, just a note to those who find the safety to snug to work on and off.